This is my first attempt at keeping a blog of what I am doing as a Kansas beekeeper. I hope that by following my actions, inspiring beekeepers in my area can keep tabs on what I’m doing during this beekeeping season. I will try to post most everything I am doing and I will also try to keep it updated, so you can see what worked, and what did not. Performed a split with a friend of mine, Julie. She had an abundance of bees and I had lost everything over the winter. We took one of her strong hives and took 2 frames of brood, and roughly a frame of pollen and a frame of nectar and oh, 3 pounds of bees or so. We found no queen in the hive we took the frames from, but there were plenty of queen cells, so we cut one of them out and I stuck it on the edge of a brood frame that we took from her hive. The hope is that in lieu of a queen, or any young larva, this would give me a viable queen rather soon. Once I got the hive to the house, I placed it in a quiet corner of my backyard and let them settle in for the night. A few bees came out for inspection during the late evening, but nothing more. I placed an open syrup feeder on top of the hive. I would not recommend this, but I had no other deep hive bodies handy to place the feeder in just yet. Many beekeepers frown upon open feeding because it can induce robbing, and it can spoil the syrup quickly from direct sunlight. Today was the first inspection of the hive from the split that I brought home. Upon inspection, to my surprise, I found that the capped queen cell I had placed in the brood frame had not yet hatched. I did some research and found that once a queen cell is capped, it can take approximately 9 days for her to emerge. I added more sugar water to the open syrup feeder and tucked them back in. Today was a bit more promising, but not much. I hated to open the hive again so soon, but I am trying to see that a queen is in the hive and laying eggs so I can relocate this new hive to the country. I found that the queen had emerged from her cell, but I saw no sign of her in the hive. My hope at this point is that she was on a mating flight when I opened the hive and will soon return. The bees were very aggressive which does concern me. From some experience, I can now usually tell the difference in the bees’ demeanor when the hive is opened. A queen-less hive has sort of an unsettled roar to it when you open it. A queen-right hive usually has a calm demeanor if everything is right with the colony, unless they are battling some other force such as hive beetles, ants, or robber bees. I closed them back up for now and plan to leave them alone for a few days. Very exciting day. I have an active listing on craigslist for free bee removal, and today the phone rang. The call was a landlord with a concerned tenant who had a basketball sized swarm on a tree in a fence row in her back yard. Promptly, I grabbed my smoker, suit, brush, spray bottle of sugar syrup, and a 5 frame nuc box with some frames of drawn comb from a previous hive. Once I located the swarm, I quickly brushed bees into the box and sprayed them with the syrup to keep them occupied. This swarm was very calm the whole time, and eventually the bees started marching into the box as I held it to the tree trunk. This usually happens once you have the queen in the box as they can smell her pheromones and will follow her anywhere. 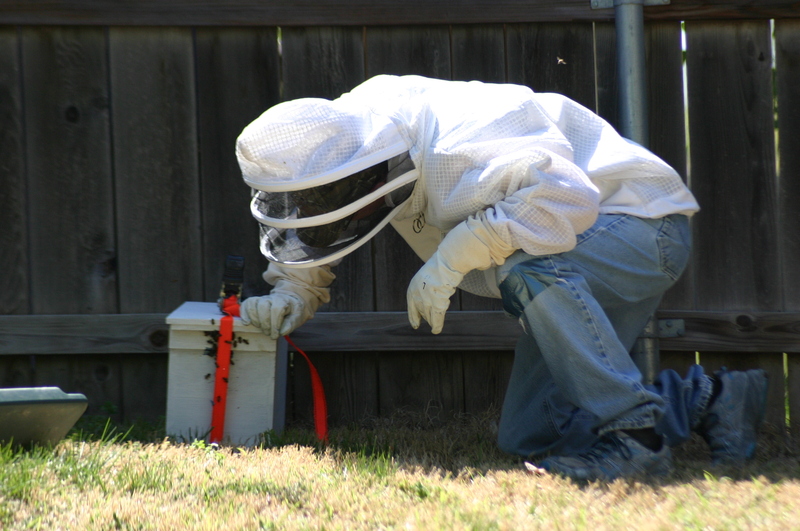 Once I had 99% of the bees in the nuc, I closed it up, screened off the entrance, tied a ratchet strap around it and headed home (in a dodge neon). I don’t recommend travelling with a hive of bees inside a sedan, but I had them securely boxed up and I kept my bee suit on with the hood dangling in case they escaped. All went well, no one was hurt.